13-year-old Arbor (Conner Chapman) and his best friend Swifty (Shaun Thomas) have been excluded from school and are outsiders in their own neighbourhood. The two boys meet local scrapdealer Kitten (Sean Gilder), the Selfish Giant of the title, and begin collecting scrap metal for him using a horse and cart. Swifty has a natural gift with horses while Arbor emulates Kitten – keen to impress him and make some money. However, Kitten favours Swifty, leaving Arbor feeling hurt and excluded, driving a wedge between the boys. Arbor becomes increasingly greedy and exploitative, becoming more like Kitten. Tensions build, leading to a tragic event, which transforms them all. Described by Total Film as a "poignant, unflinching slice of hard-knock-life grips tight and lingers long" and by Sight & Sound as "a triumph in the direction of young untried actors," The Selfish Giant is the second feature from Clio Barnard, the director of The Arbor. Boldly cinematic and boasting a pair of astonishing performances from its two young leads, it cements Barnard’s reputation as a filmmaker of rare and exciting vision. 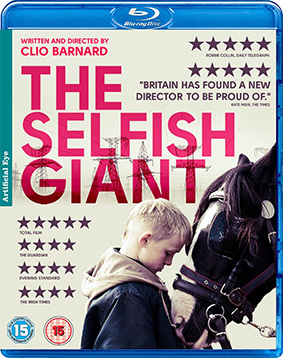 The Selfish Giant will be released on UK Blu-ray and DVD by Artificial Eye on 27th January 2014 at the RRP of £19.99 for the Blu-ray and £15.99 for the DVD.